1. The simplest option is to use a mouse and set the start option to "Left click to start, right click to toggle B&W mode" or one of the other left click options. Provided the keyboard is hidden away the users won't be able to access your computer but use the left mouse button to start the sequence and the right mouse button to toggle between B&W and color photos. a) The Powermate from Griffin Technology (http://www.griffintechnology.com/products/powermate/) is an inexpensive and nicely made device which works very well. b) The StealthSwitch (http://www.stealthswitch.com) is a very robust foot switch which simply needs to be plugged in to be used in full screen photo booth mode. No additional drivers need to be installed. The desktop hiding software that comes with the StealthSwitch should be disabled otherwise the photo booth screen will be hidden when the switch is pressed. 3. For a more professional setup you could use external panel mounted buttons. If "auto reconnect" is selected from the "Camera" menu the camera can be turned off when not in use and then turned it back on again to automatically restart photo booth operation. When the camera is turned off the camera_not_connected.jpg screen is displayed and when it is turned back on again the ready.jpg screen is displayed. The keyboard shortcuts Ctrl+1, Ctrl+2, Ctrl+3, Ctrl+4, Ctrl+5, Ctrl+6, Ctrl+7, Ctrl+8 or Ctrl+9 can be used to specify the number of copies of prints when running in full screen photo booth mode. The number pad "add" and "subtract" keys can also be used to increase or decrease the number of copies. A small confirmation message is displayed for approximately 2 seconds in the bottom right corner of the display when the number of copies is changed. A default profile can be used to reset the photo booth to a known state after each shooting sequence. If there is no internet connection available at an event you can use the offline email mode to record users' email addresses and send the emails later. Please see this section of the help file for details. Lockdown mode protects the photo booth settings with a password and can be used to prevent untrained photo booth attendants from changing the settings. Enter the password and click on the "Lockdown" button. Check it is working by clicking on the "Advanced Settings" button and a password prompt will be displayed. The live view can be digitally zoomed in full screen photo booth mode holding down the Ctrl and Alt keys and then pressing cursor left and cursor right keys. It can also be adjusted using touchscreen actions. The digital zoom range is from 1x to 4x magnification. Digital zoom works by taking a small portion of the photo and magnifying it and is an alternative to zooming the image by turning the zoom ring on the lens. Digital zoom may result in a reduction in image quality and pixellated live view images. It will also increase the time it takes to generate preview images and to prepare the photos for printing. Green screen processing will take considerably longer if digital zoom is used and isn't recommended unless you have a fast computer. The photos taken by the camera are not affected by digital zoom and are always saved showing the full frame. Digital zoom is only applied to the live view images presented to the user and to the printed photos. Digital zoom can be reset to 1x magnification using the keyboard shortcut Ctrl+Home when in full screen photo booth mode or by running the photo booth setup wizard. Typing Ctrl+Home will also reset live view cropping. Please note that digital zoom is only available in stills photo booth mode and can't be used for video. Photos can be cropped in the live view display and the final prints when using stills photo booth mode (but not when using video booth mode). The photos can be cropped horizontally - removing equal amounts from the left and right of the photo - or vertically - removing equal amounts from the top and bottom of the photo. Horizontal cropping can be used to create square photos or to create a portrait aspect ratio when the camera is in landscape orientation. Vertical cropping can be used to create a "letter box" style crop where the photo is short and wide. Cropping live view: Hold the shift key down and adjust the live view cropping using the cursor left and right keys when in full screen photo booth mode. Type Ctrl+Home to disable live view cropping (this will also reset digital zoom). The amount of cropping is displayed in the bottom right corner of the screen together with size of the cropped live view images in pixels. A crop size of 0 means no cropping, a positive crop size indicates horizontal cropping (removing equal amounts from the left and right) and a negative crop size indicates vertical cropping (remove equal amounts from the top and bottom). Use the live view size information to help select the correct amount of cropping e.g. to get a square crop adjust the settings until the width and height are the same. It's worth noting down the live view width and height as this can be used to set the cropping in the print layout. Cropping photos in the print layout: In the print layout editor the aspect ratio (and hence the cropping) of a photo can be adjusted by holding down the Shift key and dragging the photo's corners. When a photo is selected it will be highlighted in green in the layout panel in the top left corner of the print layout editor window. The size and position of the photo is updated as the corners are dragged and the width and height displays can be used to check the exact cropping. Alternatively click on the "..." button to the right of the setting for the currently selected photo to display a dialog where the width and height can be typed in. To get a square crop simply enter the same setting for the width and the height. To match the live view cropping enter the live view width and height settings. Once the correct amount of cropping has been applied the photo can be resized keeping the same aspect ratio by releasing the Shift key and dragging its corners. Repeat the process for each photo on the layout. Alternatively type Ctrl+P to select all the photos then right click on the cropped photo and select "Make photos same size and angle" to crop the remaining photos by the same amount. For most cameras (except cameras with dual pixel live view AF (e.g. Canon EOS 70D, Canon EOS 77D, Canon EOS 80D, Canon EOS 800D/Rebel T7i, Canon EOS 200D/Rebel SL2, Canon EOS 7D Mark II) it is better to use manual focus than auto focus. This is because if the camera is set to auto focus and is unable to lock focus it will not take the photo. We recommend using manual focus to avoid this problem. The simplest way to set the camera to manual focus is to set the AF/MF switch on the lens to the MF position. When setting up the booth you can focus by turning the focus ring on the lens and checking the focus on the live view display on the PC screen. Canon EOS 70D, Canon EOS 77D, Canon EOS 80D, Canon EOS 800D/Rebel T7i, Canon EOS 200D/Rebel SL2, Canon EOS 7D Mark II, Canon EOS 5D Mark IV: Canon have added fast dual pixel phase detect auto focus in live view to these camera models which makes it is possible to use continuous auto focus in live view with these cameras in photo booth mode. Please see the section on photo photo booth camera settings for more information on using auto focus. If no camera is connected photo booth can be tested using a simulated camera with a simulated live view display. When testing in normal photo booth mode or in video booth mode the software will display the normal countdown and then prompt for a folder containing sample photos or videos to display. The stylized figure can be replaced with the image of your choice by creating a PNG file named simulated_evf_landscape.png (for when the camera is in landscape orientation) and a PNG file named simulated_evf_portrait.png (for when the camera is in portrait orientation). The simulated_evf_landscape.png file should be 960 x 640 pixels in size and the simulated_evf_portrait.png file should be 640 x 960 pixels. The PNG files should contain an alpha channel containing transparency if you want the land, sky etc. to be visible in the background. The simulated_evf_landscape.png and simulated_evf_portrait.png files should be saved in the installation folder (normally C:\Program Files (x86)\BreezeSys\DSLR Remote Pro). The last print layout can be reprinted by typing Ctrl+R in full screen photo booth mode. Alternatively select the output option to also save a JPEG copy and then use a browser or image editor to select and print the required layout. A reprint selection screen is available from the ready screen which allows users (or the photo booth operator) to quickly select a set of photos to be reprinted. The reprint selection screen can be displayed by typing Ctrl+Alt+P or by using the "Display reprint screen" touchscreen action. This will display a screen showing thumbnails of the JPEG copies of prints stored in the prints subfolder. The user can select one or more photos and the number of copies to be reprinted using the touchscreen or by using the cursor keys or mouse if no touchscreen is available. After selecting the photos they can be printed by pressing the Enter key or typing A or by clicking on the printer icon in the center bottom of the screen. The user can also cancel the reprint selection screen and return to the ready screen by typing Esc or X or by clicking on the cancel icon at the right bottom of the screen. The reprint selection screen will also cancel automatically if a timeout occurs. Clicking in the bottom left corner of the screen deselects all selected photos when using the ReprintMultiSelect option. The bottom area of the reprint selection screen defaults to the Windows default background color with a printer icon and a red cross to cancel the screen. The icons can be replaced by putting PNG images named Printer-icon.png and Cancel-icon.png in your photo booth images folder. Alternatively you can use create screen image named reprint.jpg in your photo booth images folder (please note that only the bottom portion of the reprint.jpg screen will be visible). The "Thumbnail size" setting specifies the width and height of the thumbnails and the "Thumbnail spacing" setting specifies the spacing between the thumbnails. These settings are in pixels. The "Caption text size" specifies the size of the text used for the caption beneath each thumbnail. The "Timeout" settings specifies how long it takes the screen to timeout and close when there is no user input. The "Maximum number of copies" specifies the maximum number of copies the user is allowed to select. If this is set to more than 1 the currently selected number of copies will be displayed together with a - and a + sign for decreasing or increasing the number of copies to print. If a reprint.jpg screen is in the current photo booth images folder this will be displayed instead of the - and + signs. When "Display newest prints first" is selected the thumbnails will be sorted by their file creation timestamp with the most recently created thumbnails displayed first. When this option is not selected the order will be reversed and the oldest thumbnails will be displayed first. By default the print icons appear at the bottom of the screen. Select "Top" in the "Icon placement" dropdown list to place the icons at the top of the screen. Select "Allow multiple prints to be selected" if you want users to be able to select more than one print. When this is selected users can select a thumbnail by tapping on it and deselect it by tapping on it a second time. 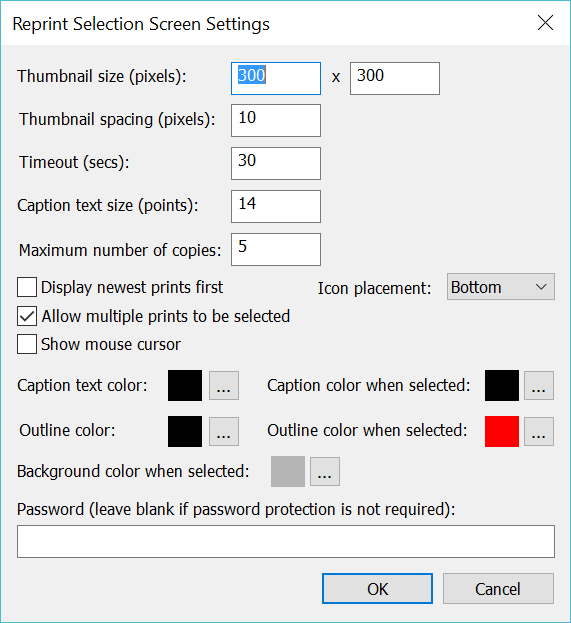 When "Allow multiple prints to be selected" is not selected only one thumbnail can be selected at a time. If another thumbnail is tapped it will be selected and the original thumbnail deselected. Select the "Show mouse cursor" option to display the mouse cursor to make it easier to select reprints when using a mouse. Use the "Caption text color" and "Caption color when selected" settings to set the color used to display the captions. Click on the "..." buttons to change the colors. The thumbnails are displayed on a white background and if the thumbnails themselves have a white background it can be difficult to see them properly. By default a thin black outline is displayed around the thumbnails to make them easier to see. Use the "Outline color" setting to change the color. A different color can be used for the outline when a thumbnail is selected to help highlight it. Use the "Background color when selected" setting to specify the color of the background used to highlight thumbnails that have been selected. Enter a password in the password field to protect access to the reprint selection screen. Leave the password field empty if password protection is not required. If the output option was set to "Print and save JPEG copy" or "JPEG copy only" when the photos were taken a JPEG copy of the printed output will be saved in the prints subfolder. The JPEG copies of the printed output can be reprinted after an event by selecting "Print selected photo booth photos..." from the File menu and then selecting one or more JPEGs for printing. 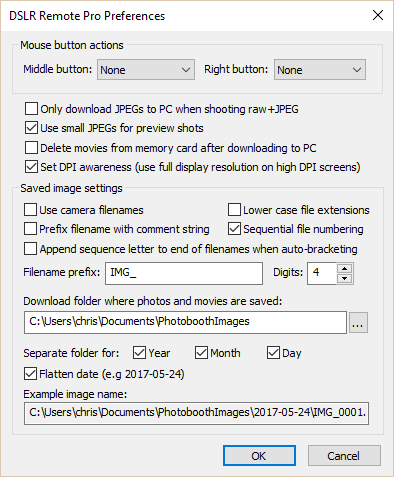 The settings shown above will save photos and videos in a separate subfolder of C:\Users\chris\Documents\PhotoboothImages for each date. The XML shooting information file (see below) is also saved in the download folder. If the output is set to "Print and Save JPEG copy" or "Jpeg copy only" the JPEG copy of the printed output will be saved in a subfolder of the download folder named "prints"
If one of the GIF animation options is selected the animated GIFs are saved in a subfolder of the download folder named "GIF"
The <date> and <time> tags contain the date and time of the first shot in the sequence. Please note that the date and time will only be correct if the camera's clock is set correctly. The camera's clock can be automatically synchronized with the PC's time when it connects to the PC by selecting the automatic synchronization option in the camera settings dialog. The <user_data> tag contains the text entered by the user if the touchscreen keyboard option is used. The <survey_data> tag contains information entered by the user if optional user survey screens are defined. The <photobooth_images_folder> tag contains the full pathname of the photo booth images folder. The <photo> tags contain the filenames of the photos taken in the shooting sequence. The <output> tag contains the relative pathname of the JPEG copy of the printed output (if selected). The <gif_file> tag contains the relative pathname of the animated GIF (if selected). Please note: if PhotoboothSuppressXml is set any information entered using the optional user survey screens will not be saved and will be lost. This setting can be changed exiting DSLR Remote Pro and then running the Configure.exe utility in the installation folder. This setting can be displayed or edited by running the Configure.exe utility in the installation folder. The print counter can be monitored by another app or script by reading the registry setting. For example if you only want to allow a certain number of prints during an event you could set the counter to the number of prints at the start of the event and monitor the value using an AutoHotKey script. The script could switch the photo booth to standby mode when the counter reaches zero or it could load a profile which has the printing option disabled and only allows photos to be shared via email etc. Please note: this counter is not the same as the number of prints remaining on a roll of media in the printer. Some printers can display the number of prints remaining via the printer driver or by running a separate print monitoring utility. DSLR Remote Pro's print counter and the shared print counter can also be viewed in the event info described below. The event info can be used in filenames (e.g. the filename and download folder of photos downloaded from the camera), caption text in print layouts or in the message text used when sharing photos by using the tokens below. The information is also saved in the Windows registry using the registry key: HKEY_CURRENT_USER\Software\BreezeSystems\Event Info. Please note: Do not use the characters \ / : * ? " | < > in the event info if it is going to be used to define filenames. Windows does not allow these characters to be used in filenames and this may prevent the files from being saved. The print template name is displayed in the "Photo Booth Event Info" dialog for information purposes only and cannot be edited in the dialog. This setting is updated automatically when a print layout is loaded in the print layout editor. Click on the "Message..." button to edit the error message that is displayed to the user when the print counter reaches zero. 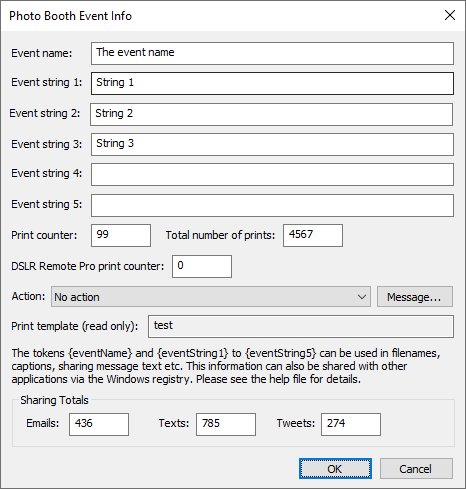 The event info can also be manually added to the XML files used to setup a photo booth. Please see the section on using profiles to setup a photo booth for details.